Bali also has a Mangrove Forest in Denpasar which is equally beautiful. 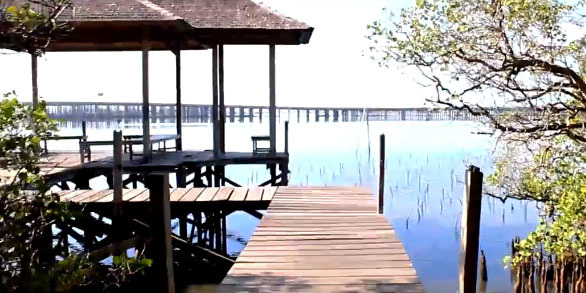 Located 10 minutes from the airport, this forest is equipped with a wooden bridge along approximately 2km along the mangrove area. At some points there are places where we can sit while enjoying the atmosphere of the green mangrove forest. Beautiful scenery where we can see a blend of green mangroves, tolls, and the blue sea of ​​Benoa bay we can get if we trace the bridge to the end. Beautiful Forest makes this place one of the popular places to do prewedding. Not only from the Balinese community, many brides from outside the city and even abroad take part in taking pictures here. Strategic position, making tourists easy enough to reach it. If you are from Sanur heading towards Ngurah Rai Airport, the exact location of the mangrove is to the left of the By Pass road, before Simpang Dewa Ruci. To explore the breadth of mangrove forests there are mangrove tracks, which are made of wood. 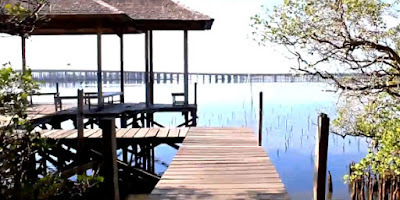 From the length of this track you will see various native biota of natural mangrove forests. The animals seemed to greet each other in silence. Like birds, fish, snails, crabs, and other swamp animals. The cool air, accompanied by a gentle breeze adds to the atmosphere. It is suitable for educational tourism while relaxing. Every walk with nature, one receives far more than he seeks! !